As the “Brains Vs. Artificial Intelligence: Upping the Ante” poker competition nears its halfway point, Carnegie Mellon University’s AI program, called Libratus, is opening a lead over its human opponents — four of the world’s best professional poker players. Libratus had amassed a lead of $459,154 in chips in the 49,240 hands played by the end of Day Nine. One of the pros, Jimmy Chou, said he and his colleagues initially underestimated Libratus, but have come to regard it as one tough player. 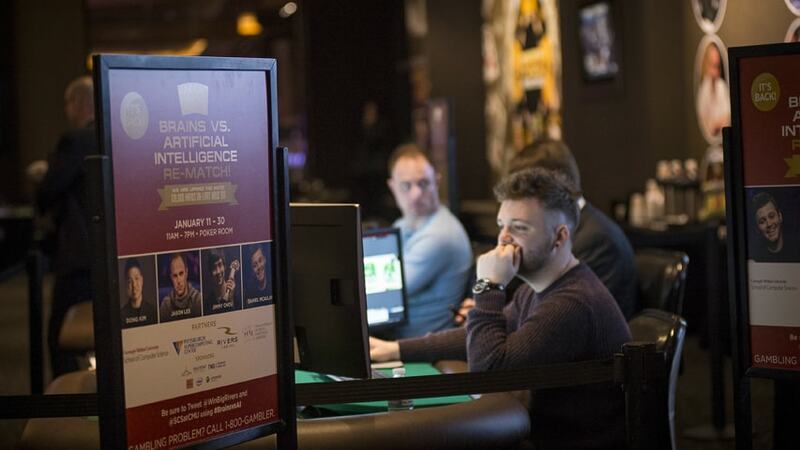 Brains Vs. AI, which began Jan. 11 at Rivers Casino in Pittsburgh, pits Chou and three other leading players — Dong Kim, Jason Les and Daniel McAulay — against Libratus in a 20-day contest in which they will play 120,000 hands of Heads-Up, No-Limit Texas Hold’em poker. All four pros specialize in this two-player, unlimited bid form of Texas Hold’em and are considered among the world’s top players of the game. While the pros are fighting for humanity’s pride — and shares of a $200,000 prize purse — Carnegie Mellon researchers are hoping their computer program will establish a new benchmark for artificial intelligence by besting some of the world’s most talented players. Libratus was developed by Tuomas Sandholm, professor of computer science, and his Ph.D. student, Noam Brown. Libratus is being used in this contest to play poker, an imperfect information game that requires the AI to bluff and correctly interpret misleading information to win. Ultimately programs like Libratus also could be used to negotiate business deals, set military strategy or plan a course of medical treatment — all cases that involve complicated decisions based on imperfect information. In the first Brains Vs. AI contest in 2015, four leading pros amassed more chips than the AI, called Claudico. But Sandholm said he’s feeling good about Libratus’ chances as the competition proceeds. “The algorithms are performing great. They’re better at solving strategy ahead of time, better at driving strategy during play and better at improving strategy on the fly,” Sandholm said. Chou said he and the other pros have shared notes and tips each day, looking for weaknesses they can each exploit. The change from day to day is not unexpected, Sandholm said. Each night after poker play ends, the Pittsburgh Supercomputing Center’s Bridges computer performs computations to sharpen the AI’s strategy. During the day’s game play, Bridges is used to compute end-game strategies for each hand. “The people at the Pittsburgh Supercomputing Center have done a great job,” Sandholm said, noting the staff has moved workloads around to enable the computer to be used in the competition. Since the beginning of the contest, the center has increased the number of Bridges’ computer nodes assigned to the poker tournament. Play begins at 11 a.m. each day and ends after 8 p.m. The public is welcome to observe game play, which is in Rivers’ Poker Room. Brains Vs. AI is sponsored by GreatPoint Ventures, Avenue4Analytics, TNG Technology Consulting GmbH, the journal Artificial Intelligence, Intel and Optimized Markets, Inc. Carnegie Mellon’s School of Computer Science has partnered with Rivers Casino, the Pittsburgh Supercomputing Center (PSC) through a peer-reviewed XSEDE allocation, and Sandholm’s Electronic Marketplaces Laboratory for this event.